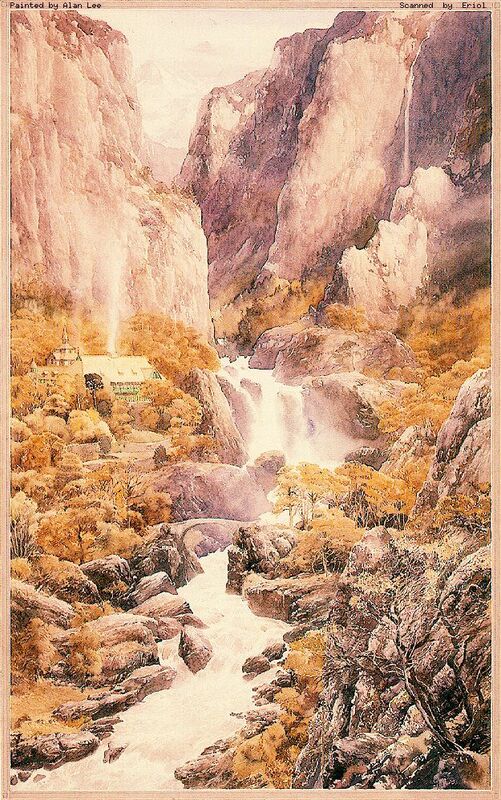 You walk across the ford and up the steep path towards the Last Homely House, which shines in the midst of a beautiful woods and lies just in the shade of the tall mountains. You sense a great conflict between the history of the House and the advancing modern world. A small plaque in front of the house pays homage to its founder, J.R.R.Tolkien. Even as you walk up the front path, Aaron rushes out to greet you and quickly show you around the house. Despite his hasty speech and hurried manner as he shows you the house, you can immediately sense his great love and attachment for this home. You can tell he is extremely busy finishing getting the house in order for your stay. During your tour he mentions that this house was once said to be "a refuge for the weary and the oppressed, and a treasury of good counsel and wise lore." (The Silmarillion by J.R.R. Tolkien, pg. 298) Aaron quietly says that he has tried to have the house continue to live up to its reputation and, he hopes, has been reasonably successful. LIBRARY for Reference materials, Books, and if you're Searching for something. HALL of FIRE for Poetry or relaxation. GAMES Room to play a Game or otherwise be Entertained. KITCHEN to see whats available to Eat and Drink. MAP Room to see what else is available around the Web when you leave the House. Audio/Video Gallery to See and Hear whatever is your heart's desire. Tea Room to relax, have a cup of Java and play some interactive games. Hall of Excellence which recognizes the best the Web has to offer. He also offers to tell you all about the HISTORY of the house and advises you to ring the Bell if you need HELP with anything. Items on a list of Aaron's own WWW works (including Musings of the Hearth (my blog), a daily newspaper, selected quotations, favorites, recipes, java, games list, and my resume) are especially recommended :). Aaron also promises you that, during your stay, a copy of his newspaper will be delivered to your door every morning. Alternatively, you can sign in to the House's Guestbook.